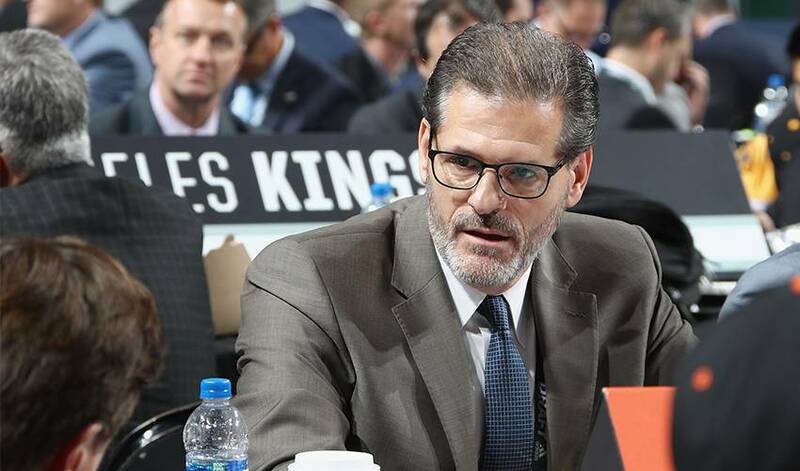 Caught at a crossroads between a full-blown rebuild and a legitimate playoff push, the Philadelphia Flyers fired general manager Ron Hextall on Monday, the latest front-office leader to fail to win the franchise's first Stanley Cup in 44 years. PHILADELPHIA — Caught at a crossroads between a full-blown rebuild and a legitimate playoff push, the Philadelphia Flyers fired general manager Ron Hextall on Monday, the latest front-office leader to fail to win the franchise's first Stanley Cup in 44 years. The Flyers might not be done cleaning house. Coach Dave Hakstol has now lost his biggest backer and his job clearly is in danger. The Flyers have a 10-11-2 record and have lost five of six. They are fresh off a 6-0 loss to Toronto in which an organization once stamped as "Broad Street Bullies" played without a penalty. "I feel a responsibility for what happened today," Hakstol said. "Nobody feels good about that in our room." Hextall, a popular Flyers goalie in the 1980s and '90s, was dismissed after 4 1/2 seasons on the job in which he tried to revive a depleted farm system and patiently build a championship contender. Flyers President Paul Holmgren thanked Hextall for his "many significant contributions, but it has become clear that we no longer share the same philosophical approach concerning the direction of the team." He added that an immediate change was in the team's best interests and he hopes to have a new GM "as soon as possible." The Flyers play Tuesday against Ottawa at home where a once-rabid fan base has stayed away from Wells Fargo Center in droves, and the ones that come serenade another listless loss chanting "Fire Hakstol!" Holmgren and Comcast Spectacor Chairman and CEO Dave Scott said they will not comment until a Tuesday news conference. The new GM will make the call on the fate of the coaching staff. Former Chicago Blackhawks Stanley Cup champion coach Joel Quenneville is available after he was fired this season. Former Los Angeles Kings GM Dean Lombardi, who won two Cups, is a former Flyers scout who returned this season to assist the front office. "I'm not looking over my shoulder," he said. "I never have. I never do. I focus on the job at hand and going forward. Those are decisions that aren't up to me." Hextall played 13 seasons in the NHL and had two stints covering 11 years with the Flyers. He also spent seven seasons as assistant GM with the Los Angeles Kings. His ouster could be tied in to his steadfast support of Hakstol, the coach he hired with no NHL experience out of North Dakota in 2015. The move stunned the NHL and Hextall seemingly staked his career on Hakstol handling the grind of coaching in pressure-packed Philadelphia. The Flyers haven't won a championship since the Stanley Cups of 1974 and 1975. They have reached the Finals and lost six times over that span. Hextall had wanted to ease off the franchise's win-now mode that had been a hallmark since the 1970s under late owner Ed Snider. Hextall inherited a salary cap mess from Holmgren, his predecessor, and inherited a talented nucleus of stars that included Claude Giroux, Wayne Simmonds and Jake Voracek. But taking a page from their Wells Fargo Center neighbours, the 76ers, Hextall wanted his own process. That meant patience and building through the draft and restocking a farm system in disarray. Sean Couturier, Shayne Gostisbehere, Travis Konecny, Ivan Provorov and Nolan Patrick, the No. 2 pick of the 2017 draft, are among the youngsters the Flyers counted on Hakstol developing. The Flyers now have roughly $7 million in salary cap space. Philadelphia did make the playoffs twice under Hextall but that seemed more of a quirk than a true step toward contention. The Flyers won 10 straight games in 2016-17 and missed the playoffs; they lost 10 straight last season and made them. The Flyers went 42-26-14 last season. "I think the players feel responsible here," said Giroux, the last holdover from the 2010 Eastern Conference champions. "I do believe we have a good team in here. We're just not getting it done." The poor play of late comes in large part to a goalie carousel that has yet to stop on a true No. 1. The Flyers have Carter Hart pegged as a future star in the minors but tried a stopgap approach this season to give Hart more seasoning. That decision — like the one to remain loyal to the Giroux-Simmons-Voracek core — has flopped and Hextall paid the price. "I don't think a lot of guys saw it coming," Giroux said. Holmgren brought back Hextall from Los Angeles in 2013 for a year as an assistant general manager. Hextall's failure as GM complicates his legacy as one of the franchise's more popular players. In 1986, he won the Vezina Trophy and helped the Flyers get within one win of the Stanley Cup before losing to Wayne Gretzky and the Edmonton Oilers on the road in Game 7 in 1987. Hextall was the Conn Smythe Trophy winner as MVP of the playoffs that year. Hextall became the first NHL goalie to score a goal by shooting the puck into the opponent's empty net. He also became the first goalie to score a goal in the playoffs. Hextall was known for his fiery temper as a player. His attacked Montreal's Chris Chelios during the 1989 playoffs, sparking a brawl. Why Ivan Provorov wears No. 9, his favourite movies and more in the defenceman for the Philadelphia Flyers' Player Q&A this week.